Something which we also hope you will do is to add photographs to the website. This is done by clicking the ‘add entry’ button and then selecting ‘media’. Click the ‘upload’ button and then use the 'browse' button to select the picture from a folder on your computer and then click ‘open’. It may take a few minutes for larger pictures to be uploaded to the website so please be patient. If the photograph is part of a collection, or you want to upload several photographs from an album and keep them together as a collection, then write a collection name in the box provided. In the caption box, give a brief description of the photograph itself. If you know it, include information like where and when the photo was taken and by whom, and what the photograph shows, e.g. ‘two American servicemen drinking beer in the Fountain pub at Tuddenham’. If you know the names of the people, aircraft or places shown within your photograph then include this information as well. 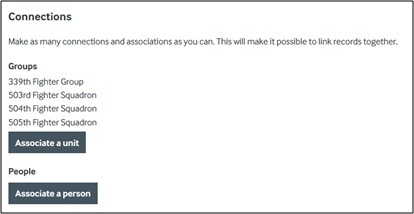 Next, try and link your photograph to as many different records on the website using the ‘associate’ buttons in the ‘connections’ section. Try to link the photograph to the pages of the people and aircraft which are shown within the photograph and to the place where it was taken. If you can’t find the records you are looking for, it may that they haven’t yet been created on the website. You can create new records yourself, using the ‘add entry’ button. It is best to do this in a separate tab or window, as leaving the page of the photograph before you click ‘save’ could mean that you lose all of the information you have added. Remember to associate any new records that you create with the photograph which you have uploaded by clicking the ‘associate media’ button under the ‘media’ tab on each of the records you create. Alternatively, click the ‘edit entry’ button on the photograph page and use the ‘associate’ buttons to search for and link the photograph to any records you have just created.